The world-class and versatile Elsom has been a regular for the Wallabies since making a try-scoring debut in 2005 against Samoa. A product of Brisbane's Nudgee College, he represented Australia at Under-16 level in 1999 and Australian Schools in 2000 before being picked up by NRL club the Bulldogs, where he spent the following two seasons. Following his return to Rugby Union in 2003, Elsom featured heavily for the Waratahs in the last three years of the Super 12 before making his Wallaby debut. The majority of his appearance have been at blindside flanker although he is a valuable option in any backrow combination or at lock. He made his Rugby World Cup debut in 2007 claiming a hat-trick of tries in the pool clash with Japan in Lyon. Elsom, who was voted by the public as the Wallabies' outstanding player in 2008, was granted an early release from the final year of his Australian Rugby Union contract after that year's Tri-Nations series on "compassionate grounds" to take up a deal with Irish province Leinster. He played a pivotal role in their run to the 2009 Heineken Cup Final and claimed the man of the match honour in their Murrayfield triumph over Leicester. At the end of the season Elsom confirmed his plan to return to Australia to further his international hopes and subsequently signed a two-year deal with the Australian Rugby Union and the Brumbies. Elsom's return to Australia paid off in the form of the Wallabies' captaincy. He became the 76th captain of Australia when coach Robbie Deans announced his squad for the 2009 end-of-year tour. He retained the captaincy for 2010 and spearheaded the Wallabies' Tri-Nations challenge - grabbing a try against the Springboks in Bloemfontein to propel his side to their first win on the high veldt since 1963. 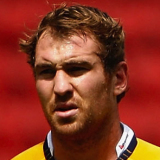 The following season Elsom's participation in the Brumbies' Super Rugby campaign was restricted by injury. And although he was initially named as captain for Australia's Tri-Nations campaign, fellow forward James Horwill was announced as the new skipper for the Rugby World Cup. Elsom, though, retained his place in the Wallabies squad. In June 2012 Elsom announced that he would join Japanese side Kobe Steel after injury restricted him to just three appearances for the Waratahs in Super Rugby that season.